Looking for a place to take the family for a quick getaway? I would suggest visiting Phoenix. 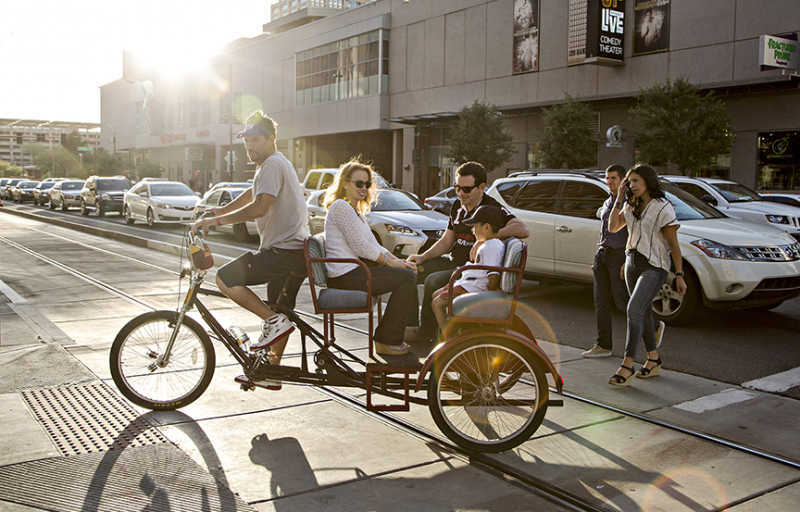 Check out our suggestions of where to stay, which restaurants to try, and fun things to do in Phoenix with the kids for a quick weekend getaway or even a week long one. Fly – Phoenix is 1hr 15mins away from Los Angeles Airport. Sheraton Grand Phoenix – We stayed here. It’s central to a lot of places to visit in Downtown Phoenix including the Children’s Museum of Phoenix, Talking Stick Resort Arena (Phoenix Suns game), Chase Field, etc. You can walk to some of the Phoenix attractions or it’s a quick cab drive away. There’s some restaurants in the strip mall in front of the hotel plus a Starbucks and a cinema. Your room will have an amazing view as this hotel is really high. There are a lot of rooms in this hotel so you’d have a good chance of booking a room if you’re booking last minute for a quick getaway to Phoenix. Parking and breakfast is extra. Spring Hill Suites Marriott Phoenix – We didn’t stay here but it would have been a good deal and location is also really good. This is the closes hotel to the Children’s Museum of Phoenix and the famous Pizzeria Bianco restaurant. Free breakfast and parking. This is a smaller hotel so it may be fully book if you’re trying to book last minute. Hyatt Regency Phoenix – I’d like to try this hotel on our next visit. I saw Einstein Bros. Bagel at the ground floor, one of my faves. The hotel is in front of the Phoenix Convention Center and a really close walk to the Talking Stick Resort Arena and Chase Field and a lot of restaurants abound. The hotel has 2 queen bed type of rooms for families traveling to Phoenix and sharing a room. Parking and breakfast is extra. Bobby Q – This is not in Downtown Phoenix and is quite a drive but it’s totally worth it. The best cornbread we’re tried to date, and I’m not even a huge fan of cornbread but this one won my heart. And yes, their BBQs are great too including the nice mini donuts they offer in the end. Tons of parking available is a plus. Great for a big group as well. Check everything we ate at Bobby Q. La Santisima – A hole in the wall restaurant to try when you’re visiting Phoenix. It was suggested by my cousin’s cousin and I’m so glad we got to try it. Just the number of available and unique salsas from the salsa bar alone is already worth the trip. Hubby said their Horchata was really good while I enjoyed all the different tacos they have. There’s not a lot of available seats nor parking so try to get there early. Pizzeria Bianco – It’s very famous and was on our itinerary but unfortunately the wait was quite long and the kids were already hungry. If you’re visiting Phoenix, try to get there early. Valet is available or just try to walk to it if you’re staying at one of the hotels in Downtown Phoenix. You cannot order “to go”. Children’s Museum of Phoenix – I’d have to say this place is not only fun, it’s also well thought of. The way they re-use materials, the different things you can do, every tiny little detail was though of in designing this museum. It’s a Must Visit!!! 3 floors of fun and has an outdoor area too. Check all the fun things we did at Children’s Museum of Phoenix. Legoland Discovery Center – This is nothing like Legoland California that we’re use to. It’s indoor and is like a bigger version of a jungle gym but has some rides, LEGO 4D movie, etc. You can build legos and even eat there and if you still have a lot if time, you can also visit the SeaLife Aquarium next door. This is located in Tempe, AZ. Just a quick drive from Downtown Phoenix. 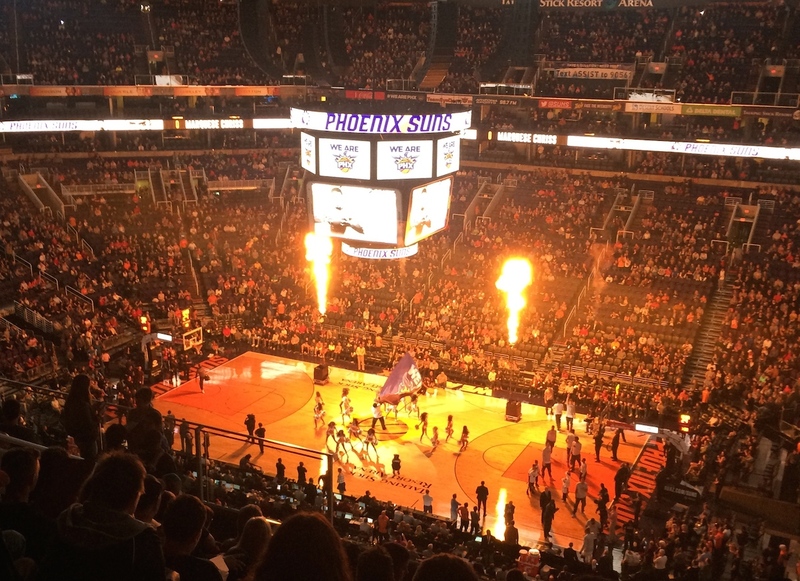 Watch a Basketball Game at Talking Stick Arena – We took the kids to their first basketball game. They got really bored, haha. But I’m sure the bigger kids would enjoy. Ours is a little too young. Cerrata Chocolate Factory Tour – We went here on our way back home going West. It’s in Glendale, AZ. It’s a free chocolate factory tour and their brittles were really good. If you have time to spare, I’d say take the kids. If the kids want to make their chocolate pizza, it’s only $12.50 each. Our post on Cerrata Factory Tour will be posted next week. Tour Downtown Phoenix on a Pedicab – We called for a pedicab service to give us a tour of Downtown Phoenix on our 1st night there. It’s a great way to know where everything is. I forgot if we paid $20 or $40 but I highly recommend it as they really know all the spots. Just make sure to hold the kids tight, it’s open with no seatbelt. We did watch the movie “Sing” on one of the nights while we were in Phoenix since there was a cinema in front of our hotel. Our trip was a mix of site-seeing and just relaxing at the hotel. It was a really good trip. There’s still a lot of places to do, see and eat in Phoenix but I only want to recommend the ones we actually got to experience and the ones I know are highly rated and was on our itinerary. If we ever visit again, I’ll add more to the list.